It’s summertime and you know what that means, don’t you?? Lots of “ARE WE THERE YET?” coming from the backseats of minivans and SUVs all over the country. It seems that nearly every family hops in the car at some point during these summer months and heads out on an adventure. Sometimes these road trips are 3 hours and sometimes they are 33 hours. I have to admit that today’s post is somewhat selfish in that I am heading out on one of these adventures myself (only 8 hours though) and will have a car full of teens and tweens! My kids are old enough now that they tend to entertain themselves by listening to music, watching movies or reading books but every once in a while I start thinking that we really ought to interact more on these long trips. I know, what a concept, huh? 🙂 I mean think about it…they are trapped in a car with their parents for hours on end and I think it is a fantastic opportunity to get to know each other better. So I started looking around for some great interactive road trip games and began compiling some ideas. It seemed like a lot of the ideas out there were for elementary school age kids or younger so I focused my list on ideas for older kids (I told you this was a selfish endeavor!). So if you have some older kids that you want to connect with on your next road trip, today is your lucky day! I made a few printables to make it easier on all of us. First, I compiled a bunch of games I thought my (and your!) kids would like and created this cute printable for you to print out and tuck in your purse. Pull it out on your next trip, pick a game and see how your kids react! I bet they will totally get into them! Some are silly. Some need some brain power or big imaginations. All are lots of fun! You can download this as a JPEG HERE or a PDF HERE. As I was researching for some fun games I came across several sites with questions for the popular game “Would You Rather…?” This is a game that anyone can play, anywhere, at any time where one person asks another a series of questions where the choices are nearly impossible to decide on. Such as “Would you rather cure cancer but be poor or have $100,000,000?” These questions are a great way to start conversations as people love to explain why they would choose one or the other. The only rule is you HAVE to choose one of the choices! I compiled a long list of questions and put them in a printable so all you need to do is print it out, cut them apart put them in a container of some kind. 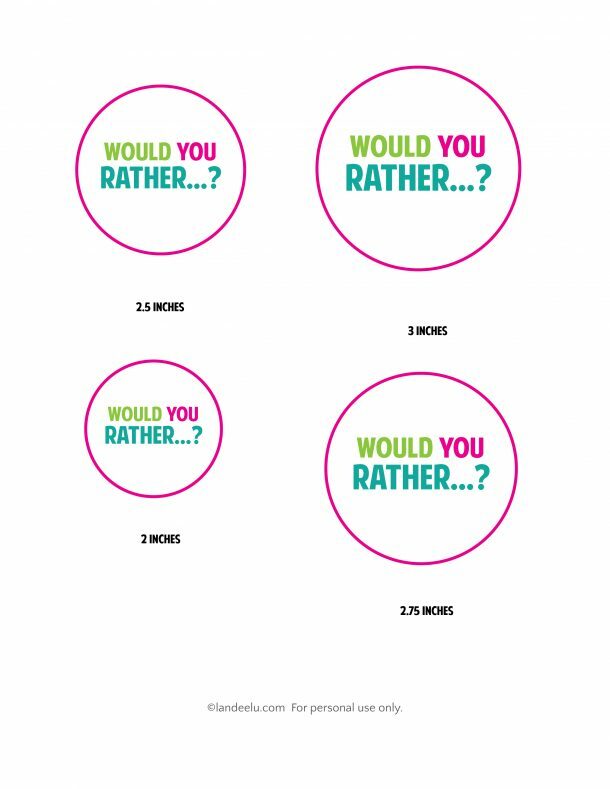 Download the Would You Rather Questions HERE and the circle topper JPEG HERE or PDF HERE. So that’s it! If you have a long car ride ahead of you and your family hopefully some of these games will make that time as memorable as the actual destination! Let me know if you have any other fun car games you have played with your teens/tweens! PIN THIS IMAGE so it’s handy! !! I am taking my kiddos on a trip this weekend for Thanksgiving and was sort of dreading it because they are at the awkward tween age but this will help out a ton. and its not an app I love it thank you again! 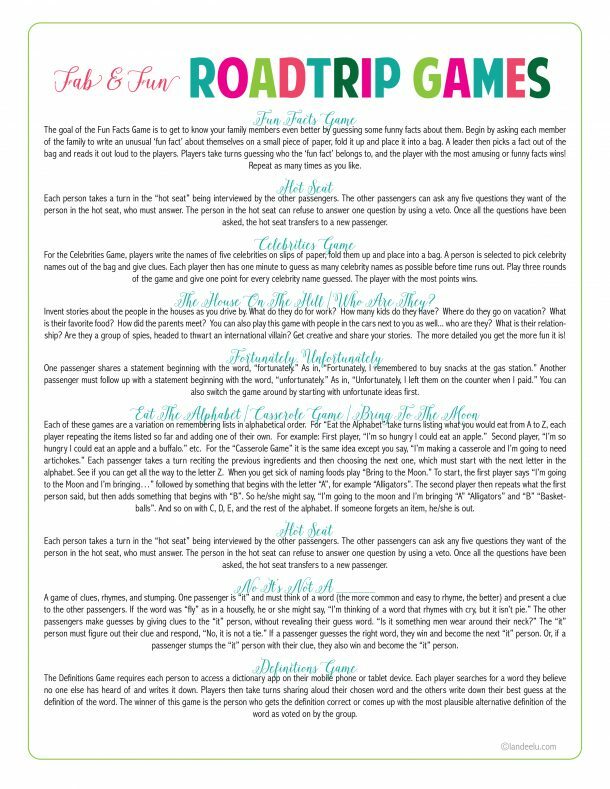 I really like the road trip game sheet there are a few new games I had not seem before. The game hot seat is listed twice? Was another game left off by accident? Is there an edited able copies that I could possible use to remove the duplicate and maybe add a different game? I want to print it an laminate it for my car. ? My family is flying from SC to WA this summer. My daughters are 7 and 6, but the 6 yo is more like a 4 yo. The color pages will be WONDERFUL for them to do on the planes and at grandma and grandpa’s house when they claim to be “bored”. Thanks a lot for these wonderful resources. These are so fun, however the font is so small I wish there was a way to edit that. Super awesome idea.